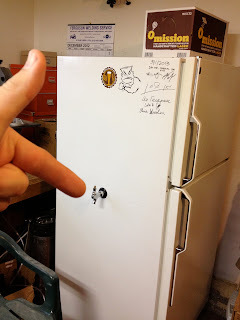 catholicbeer: 025* and a Kegerator! Batch #025 was brewed last week along with the genesis of my kegerator! Friends, family and neighbors stopped by for this joyous occasion. Biggest thanks to Luis for offering his old fridge pro bono. I, of course, told him he could come by any time and enjoy a pint or four (and that goes for you too!!). I couldn't hook up my keg of Imperial IPA fast enough and was pouring in minutes.